I love making recipes with my boys. 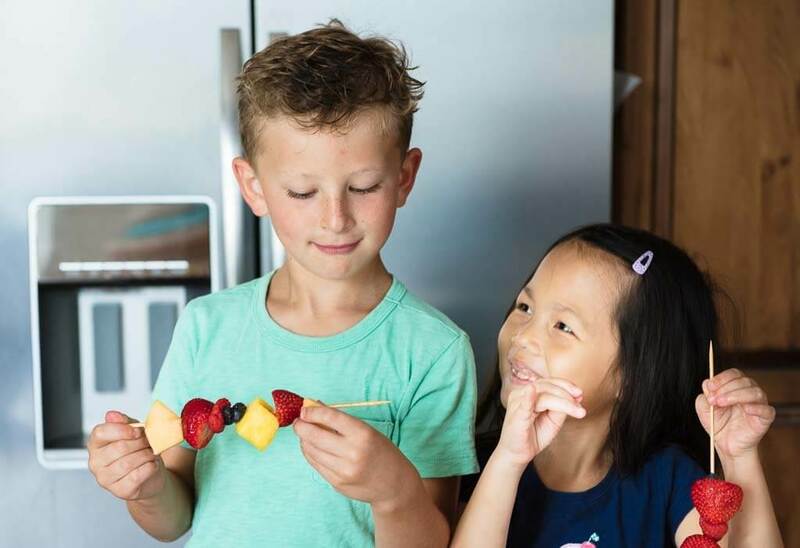 They get so excited when I ask them to help me in the kitchen, and they loved helping me make these Kid Friendly Fruit Kabobs! 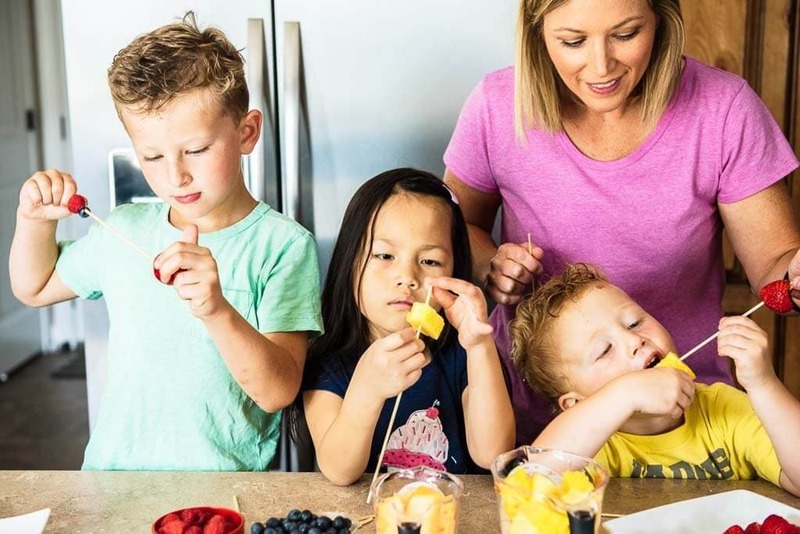 One of the main reasons I enjoy them helping me in the kitchen is because I want to teach them that cooking at home can be really fun, and easy, too! I want them to have memories with me getting our hands dirty and making a recipe that we all enjoy. I also want them to enjoy fruits and veggies without thinking they are a food they “have” to eat. Doesn’t that just feel awful to even say? Who wants to hear, “You have to eat your veggies?” Not me. I immediately think it’s going to be unpleasant and don’t want to do it. I am hoping to raise them with food neutrality and think of all foods as “just food”. It’s important to me to raise them to be healthy eaters, but I don’t want them to have negative feelings surrounding that either. Raising healthy eaters is important to me, but I want it to feel “natural”. With that said, I want their meals to be balanced and that includes delicious fruits! 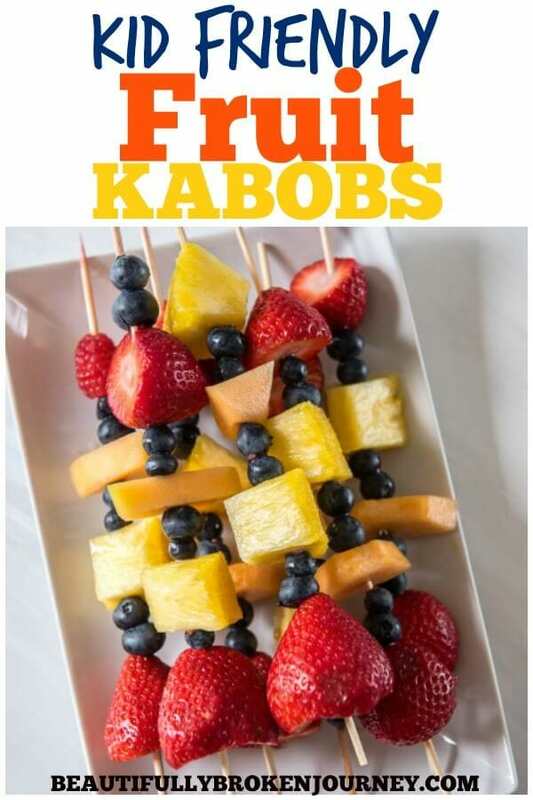 When I was coming up with something I could make with them these Kid Friendly Fruit Kabobs came to mind and I knew they were going to love helping me and create their own! These are so easy to make, and they really had a blast! 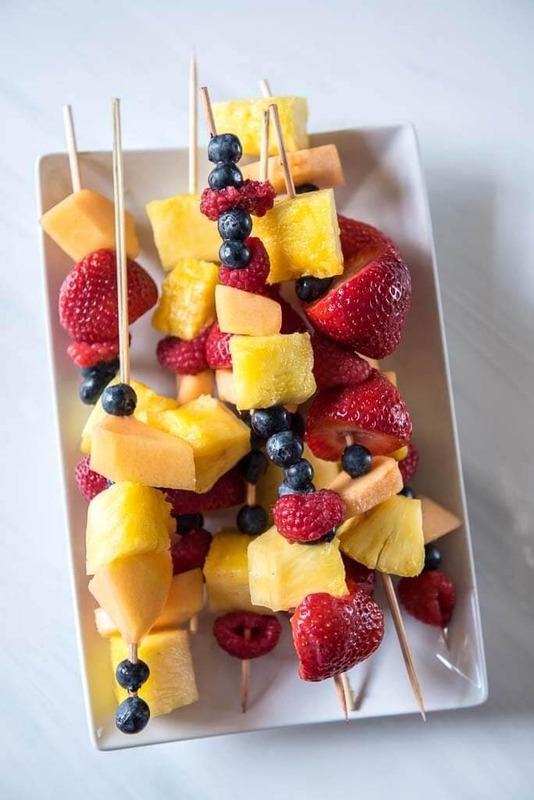 Even if you don’t have children, you can make these Fruit Kabobs as a pretty appetizer for all sorts of occasions! The kids gobbled these up in no time! They were proud of them because they made them and I think it make this healthy snack even more appealing because they did so. 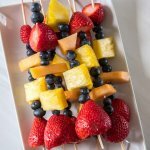 I hope you enjoy these delicious Kid Friendly Fruit Kabobs and make precious memories with your kiddos, too! 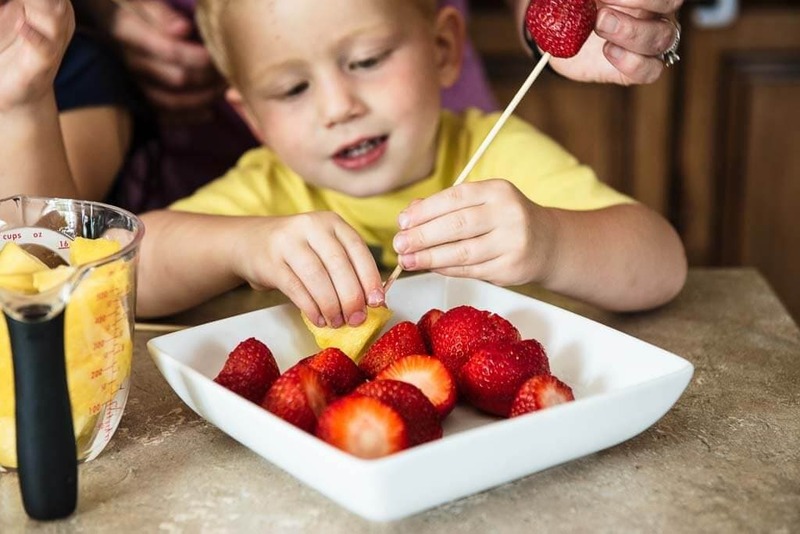 Use your favorite fruits and make your own delicious fruit kabobs! Cut stems off strawberries and wash. Remove skin and core of pineapple & cantaloupe and dice into 1" chunks. 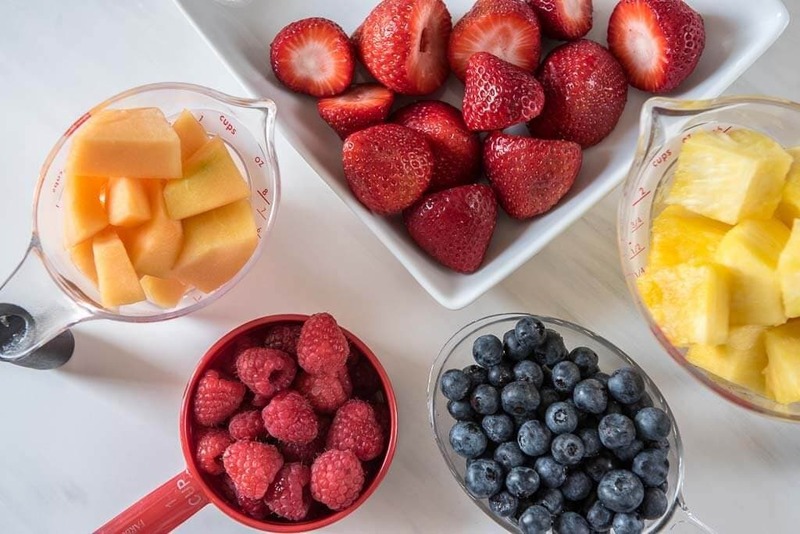 Place each fruit in a separate bowl. Take kabob and thread each piece of fruit on separately. Mix and match fruit and have fun! Nutrition Information will vary depending on what fruit you use and how much you put on each kabob. If you need to calculate nutrition information for health purposes, please use this only as a guide and calculate your nutrition based on the kabobs you make.